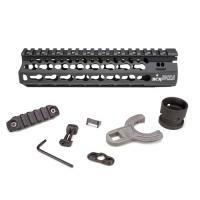 Bravo Company USA KMR-A8-556-BLK KMR KeyMod Rail Alpha 8" Handguard FREE SHIPPING! The Bravo Company USA KMR KeyMod Rail Alpha 8" Handguard is an extremely versatile aftermarket handguard for firearms with military specification barrel sizes. Its KeyMod system provides versatility beyond that of the classic 1913 Picatinny rail, providing universal modularity for all accessory manufacturers. This allows you to equip your firearm as you see fit to accomplish any mission. It features four offset mounting positions between the standard 3, 6, 9 and 12 o'clock points, providing greater positioning freedom for your accessories. The handguard is made from lightweight, durable aluminum, and features a corrosion-resistant hardcoat anodized coating. It also comes with a BCM KeyMod Sling Mount. ©2002-2019 CopsPlus.com: Bravo Company USA KMR-A8-556-BLK KMR KeyMod Rail Alpha 8" Handguard FREE SHIPPING!